It's been almost 13 years since goalie Dominik Hasek announced his retirement for the first time. Since then, his career his continued in fits and starts. Instead of contemplated retirement, Hasek was eventually traded to the Detroit Red Wings and won the Stanley Cup with them in 2002. He officially retired after that, but after just a one-year break, he came back to join the Wings again. He continued playing after the lockout for the Ottawa Senators and came back to Detroit one more time to win the Cup and announce another retirement in 2008. But after another one-year break he returned to the crease, this time to win the Czech Extraliga title with HC Pardubice, where he had started his career. In 2010, Hasek signed a one-year deal with the Spartak Moscow in the Kontinental Hockey League. He retired once more last year. "I am working hard almost every day. I am in great shape. And the other side knows that. If the deal is done, I would start with even more intense workout from the end of June or so. I am not skating yet, I usually do that just before the season. But it does not mean I am not getting ready. Now we have to wait what happens and start right from there." Now, at the age of 47, the Dominator wants to come back once again. And, surprisingly, it seems that the NHL is the only option for him. According to Czech newspaper Denik Sport, Detroit or Tampa Bay are among teams that might come into play. Hasek travelled to the United States earlier this month to visit his son, Michal, at Michigan State University, but he reportedly also met with the managers of a few NHL clubs. "We are working on [a new deal] but I don't know the answer yet," Hasek told Denik Sport. Despite his most recent retirement, Hasek spent a busy year full of other sports: cycling, skiing, spinning, soccer and volleyball. His various activities drove him to cross Albania by bike, to ski on a glacier in the Alps with Czech Olympic downhill skiing medalist Sarka Zahrobska, and to compete with professional drivers while racing at the Lamborghini Super Trofeo Race in Barcelona. "I wanted to do some sport at least five times a week. 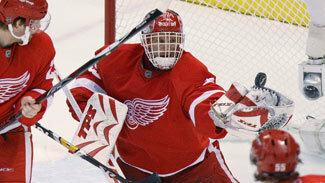 I wanted to stay in a good shape to be ready to step into the hockey training again," Hasek told NHL.com in March. At the time, he said he had a plan when he returned to hockey training, but refused to discuss it. Now, it appears Hasek had his eye on the NHL all along. "Of course, my agent Rich Winter knows about what I want. But I don't want to comment on that any further. Nothing changed in my plans. But right now, I don't have anything in front of me. So I'm waiting. I think in June the decision will be made," Hasek told Denik Sport. "I know where I would like to play, but I don't want to talk about it. I think it's better to keep it between the two sides involved. It wouldn't be appropriate to publish anything right now." Hasek's trip to North America is not the only indication that the Dominator is aiming toward the NHL. He turned down the offer from the Czech club KLH Chomutov and he admitted that Russia was not interesting for him anymore. "I don't know about [the offers from the Russian clubs]. And, to be honest, I don't even care," he said. "I've had many offers from European clubs, but my answer was just: 'No, thank you.' That was not what I wanted." Apparently, what he wants is the NHL. It is a pretty daring plan, but as he has proven many times, nothing is impossible for the Dominator. Hasek has won the Stanley Cup twice (2002 and 2008), Olympic gold (1998) and three domestic league titles (1987, 1989 and 2010). He has six Vezina and two Hart Trophies on his mantle. But spending evenings on the sofa showing off his silverware and telling kids stories about "how it once was when I was playing hockey" is not an attractive outlook for this restless character. Instead of sitting and looking forward to becoming a grandpa one day, Hasek has talked with his personal coach Josef Bruk about setting plans for the summer training. "I am working hard almost every day. I am in great shape. And the other side knows that," he told Denik Sport. "If the deal is done, I would start with even more intense workout from the end of June or so. I am not skating yet, I usually do that just before the season. But it does not mean I am not getting ready. "Now we have to wait what happens and start right from there."